D.C. Love Locs Natural Hair Expo is a community event that is held yearly. This Family affair is to celebrate Natural Hair all in the good company of Natural Hair wearers from all over the D.C. Area. D.C. Love Locs Expo, showcase educational workshops on “how to styles”, Food provided by the best caterers, Fabulous fashion/hair shows, shopping and plenty of networking. 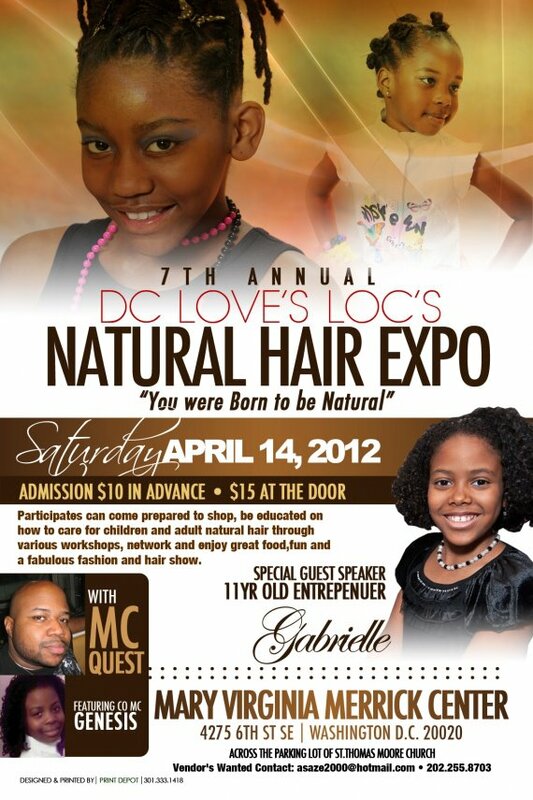 Below is a flyer for our 7th Annual D.C. Love Locs Expo coming up April 14, 2012. I hope to see you there. I am interested in vending opportunities. Please email me. how do you buy tickets in advance? advance tickests can be purchased on http://WWW.Eventbrite.com search for event in your area of Washington and type in dc love locs. Hello sharon,you are in for a great treat! Tempie, can’t wait to see you again! Melodye and I will be there! Jacki from Lyn Dancn Club, Inc.
What time does the festivties begin, is this an all day event? Would love to attend. What time are the classes offered? I’m interested in mommy can daddy can too. Thanks. Thanks. I will not be able to make it till later in the day. Will the classes be offered later in the day also? If so up until what time? Wish i would have know about the event. do you have a mailing list? Email me and i will add you to my list and you will be able to learn about upcoming events as they are planned! I am interested in vendor information. Please email me. Thank you!